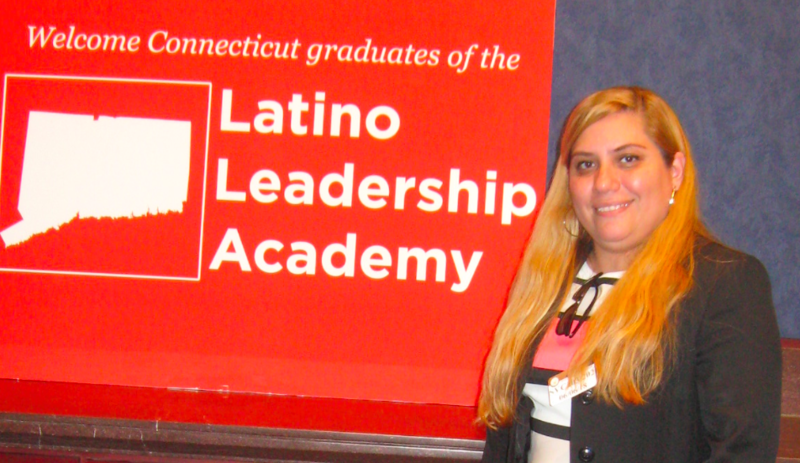 Washington – The growth of Connecticut’s Latino community is increasing its political clout and fostering the ambitions of Milagros Acosta and other Hispanics to pursue a career in politics. “Everything is possible,” said Acosta, who emigrated from Peru when she was 22 years old. 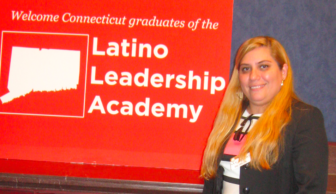 Acosta, 40, is one of 17 recent graduates of the Latino Leadership Academy, an organization formed by Sen. Chris Murphy, D-Conn., and the General Assembly’s caucus of Hispanic Democrats and supported by the state’s congressional delegation. On a trip to Washington this week to see firsthand how Congress operates, Acosta and her fellow graduates share a penchant for activism and community work. They were all in the second class of the academy, which graduated its first class last year. Acosta, who lives in West Hartford, is a social worker who also works as an outreach coordinator in the General Assembly. “I’m very involved in my community,” she said. Her ambition is to be elected to the state House or Senate one day. The growth in Connecticut’s Latino community has not been matched by political representation. Although there has been an increase in Latinos in elected office, it lags the state’s growth in Hispanic residents and voters in the General Assembly. There has never been a Latino in the state’s congressional delegation and only two in the state Senate. According to a Pew Research Center study, 15 percent of the state’s residents were Latino in 2016. About 540,000 Hispanics lived in Connecticut in that year, the center said, and the state’s Hispanic population was the 18th largest in the nation. About half of those Latinos, or about 280,000 people, were eligible to vote in 2016, the center said, up from about 265,000 in 2014. The number of eligible Latino voters is expected to have grown by much more this year. Murphy and other lawmakers involved with the academy are aware of the demographics. Being involved with the Latino Leadership Academy helps their relationship with the community. Meanwhile, those attending the academy benefit from five classes offered on Saturdays in January and February that teach organizing, public policy, advocacy skills, invaluable insight into how the political system works, as well as a two-day seminar in the U.S. Capitol. Angela Peralta, 31, another academy graduate, is vice chair of the New London Democratic Town Committee. She hopes one day to run for city council, but says he has a 4-year-old son so she’s “kind of waiting” to advance a political career. Arriving in Connecticut from the Dominican Republic when she was 15 years old, Peralta is a high school teacher who says there’s a shortage of minority educators in Connecticut schools. She said Latinos are politically underrepresented in the state, but that things are improving. Concerns about diversity on the statewide Democratic ticket helped boost the late candidacy for lieutenant governor of Eva Bermudez Zimmerman, a union organizer who lives in Sandy Hook and is of Puerto Rican decent. Only three days after declaring her candidacy, she easily qualified for the primary in August. 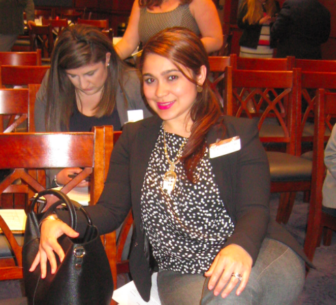 But to Yolanda Castillo, a former Hartford councilwoman who recently won a seat on the Manchester Board of Directors, there’s a lot to more to do to bring diversity to Connecticut’s political establishment and more outreach needed to Latinos. 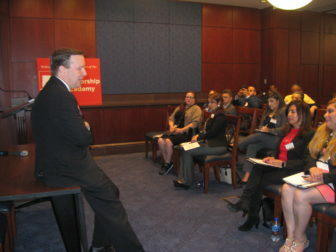 Sen. Chris Murphy addresses the Latino Academy. “The numbers [of Latino elected officials] are getting better, but [other politicians] are not paying us enough attention. They think we don’t come out to vote,” she said. Exit polling in 2012 showed 6 percent of the presidential votes in Connecticut were cast by Latinos. Similar data for 2016 was unavailable. While 52 percent of the state’s Latinos were eligible to vote in 2016, according to the Pew Research Center, 79 percent of the state’s white, non-Hispanic population was eligible to vote. Still, Connecticut’s Hispanic voter eligibility is greater than that of many states. The state ranked 13th in the nation in the share of the Hispanic population that is eligible to vote. According to the Pew Research Center, 5 percent of eligible Hispanic voters in Connecticut are of Mexican origin, 67 percent are of Puerto Rican origin, and 28 percent claim other Hispanic origin. Among all Hispanic eligible voters nationwide, 59 percent are Mexican, 14 percent are Puerto Rican, and 27 percent are of some other Hispanic origin.